A dramatic example of Boyle’s’ Law that can be used time after time. Simply darken the room, place a small tuff of cotton inside the clear acrylic cylinder and firmly push down the plunger and see the FLASH as the cotton ignites from the heat of the compressed air.. Learn firsthand about a unique relationship between gas pressure and temperature with this kit. 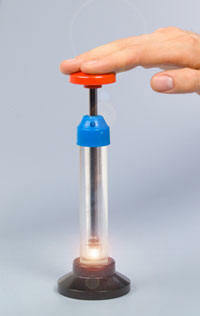 A ready-to-use fascinating apparatus to demonstrate how temperature increases with pressure. This scientific fact is dramatically demonstrated by igniting cotton tinder in side the clear cylinder as the plunger compresses air in a cylinder. A heavy aluminum rod fits inside a clear acrylic tube. A piston tipped with O-rings and fitted with a contoured handle is used to compress rapidly the gas, raising the temperature sufficiently to ignite a small piece of cotton in the tube. 1. The setup is quick and easy. First, pull out the plunger and drop in a small piece of the cotton tinder. 2. Re-insert the plunger gently so that it just enters the mouth of the piston chamber. 3. Holding the unit flat on a non-slip surface, push down the plunger with some force and speed. point that ignites the cotton tinder. The combustion will last until all available oxygen in the cylinder is used up. Air gets very hot when compressed under high pressure. If you have ever pumped up a bicycle tire, you have noticed the heat generated. The Unit has a “compression ratio” of approx. 18:1 (the volume of cylinder is 9ml and reduces to .5 ml when the plunger is compressed). When the air in the Fire Piston Demo Unit is compressed, it is done so fast and efficiently that it results in a temperature increase to well over 210C (378F), the “flash ignition temperature” of cotton. In fact it can reach instantaneous temperature of over 260C (500 F) inside the cylinder! When it is compressed rapidly, gas undergoes an adiabatic thermodynamic process, one that occurs without loss or gain of heat. As the volume is reduced, pressure increases very quickly. The temperature of the gas also rises, because there is not time for the heat energy to transfer to its surroundings as would normally happen. This increase in temperature can cause flammable substances to ignite with “hot air” alone, just like a diesel engine! How does a diesel engine work? A diesel engine compresses air inside a cylinder (which leads to an adiabatic temperature increase) and then injects fuel at just the right moment so that it combusts from the heat. The fuel combustion forces the piston down, producing the engine’s power. This design, where fuel is directly injected into the cylinder at the top of the engine’s compression stroke, prevents engine knock, unlike a gasoline engine that uses a spark plug for ignition. (The fuel in a diesel engine combusts spontaneously from the heat, rather than requiring a spark to ignite it.) Since there’s no danger of causing knock, the diesel engine can use higher compression ratios than gasoline engines. Diesel engines with high compression ratios are more efficient than gasoline engines, which is why large trucks and ships use diesel engines. When it was invented in the 1890s by Rudolf Diesel, though, the engine was sneered at. A diesel engine starts with an intake stroke, where air is sucked into the cylinder as the piston moves down. The next compression stroke occurs when the piston moves back up, compressing air rapidly in an adiabatic process. In the power stroke, the fuel is injected and ignites, pushing the piston down and powering the engine with the energy produced. In the exhaust stroke, the piston moves back up, pushing the burned gases out. Very little maintenance is needed. 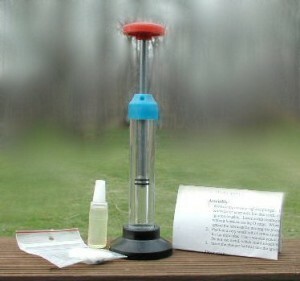 Your plunger has been per-lubricated and should not need additional lubricant for sometime, however additional lubricant is included with the unit if you want to use it before each demonstration o extend the life of the o-rings..
After each use, clean out the cylinder with a wooden stick or simply blow out the carbon dust from the small fire you just made. The Demo Unit is ready to use again.